The original recipe for these super delicious cheesecake squares called for a chocolate glaze but I did not want it to eclipse the dulce de leche flavor; after having one square I felt that omitting the glaze had been the right decision: the cheesecake tasted wonderful and very rich, it did not need any embellishments. Crust: put oven rack in middle position and preheat oven to 160°C/325°F. Lightly butter a 20cm (8in) square baking pan then line the bottom and sides with 2 pieces of foil, leaving a 5cm (2in) overhang on two opposite sides. Butter the foil as well. Finely grind cookies with sugar and salt in a food processor. With motor running, add butter, blending until combined. Press mixture evenly onto bottom of baking pan. Bake 10 minutes, then cool in pan on a rack 5 minutes. Filling: sprinkle gelatin over milk in a small bowl and let stand 2 minutes to soften. In an electric mixer, with the wire attachment, beat together cream cheese, eggs, salt, gelatin mixture and vanilla until well combined, about 2 minutes, then stir in dulce de leche gently but thoroughly. Pour filling over crust, smoothing top, then bake in a hot water bath in oven until center is just set, about 45 minutes. Cool cheesecake completely in pan on rack, about 2 hours. Chill, covered, at least 6 hours. Carefully lift cheesecake from pan using foil overhang and cut into 16 squares. I still have one big tub of Brazillian DDL. oh my goodness! I'd eat far too many of these delicious little bites! Oh, yum! 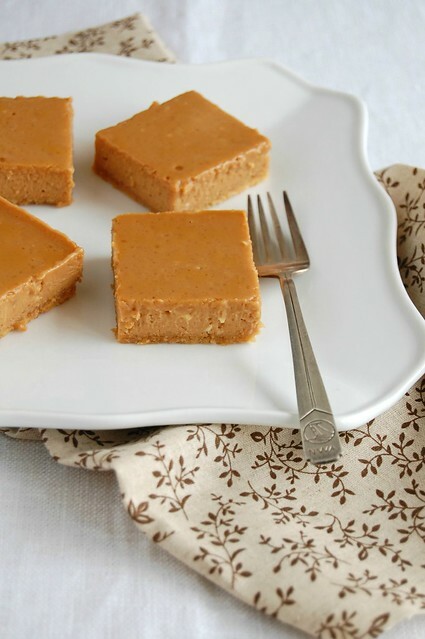 I think you're right - if you already have dulce de leche and cheesecake, who needs chocolate? 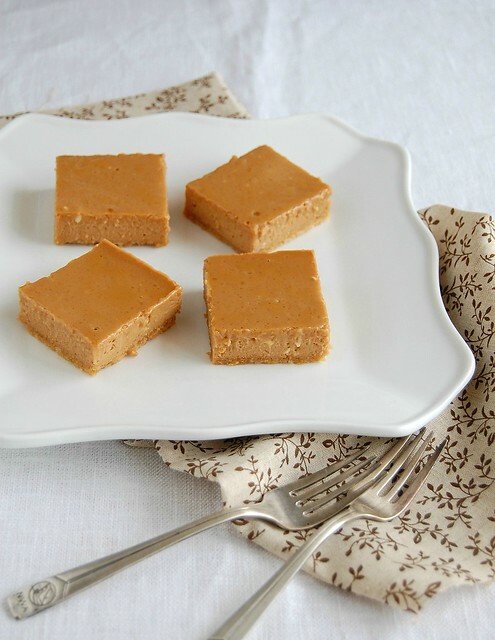 You have read my mind...I just made a fresh batch of Dulce de Leche today and these are just way too gorgeous to not put my dulce de leche to good use. These are gorgeous, Patricia, and I am sure they taste as good as they look! You are seriously talented! To make dulce de leche you must boíl for 1hour in water a can of condense milk. Wait for it to cool before opening. Wow. Yums! A decadent but oh so satisfying square! Its in my oven now! I cant wait till the hubby comes home and takes a whiff!